Hello everyone and welcome to another season of BIIIIIIIG BROTHERRRR! Julie Chen teases lots of twists BUT FIRST totally spontaneous in no way at all setup video packages to introduce the contestants. Natalie is an event coordinator/NFL cheerleader with ample cleavage. Paulie runs a gym and is the less attractive sibling of Cody from Big Brother 16. Bronte has a voice made for cartoon and aspires to be a mathematician in a house full of mactors. Victor has Jon Snow hair and likes to dance, Zakiyah is a beautiful pre-school teacher, Corey is a bland baseball coach, and Bridgette is a bland travelling ER nurse. Glenn is from the "Boogie Down Bronx", which he says so much I want to punch myself, and is a dog groomer and the oldest guy in the cast. Jozea is a makeup artist that wears a hat he must've stolen from Blossom into the house. Tiffany coincidentally sits on her Big Brother house key on the beach and reveals she is the sister of Vanessa Ruosso from last season, game mastermind and emotional wreck. Michelle is a nutritionist with a lot of outrageous fears and Paul has a massive beard and wears leather. I'm sure we'll hate all these people in about 11 days. The first twelve houseguest are corralled on the stage for one last glimpse of the semi-real world before being locked away for the summer. After Julie urges them basically to hookup and play the game, the houseguests are slowly unleashed on the cool travel-themed house. The twelve new houseguests sit on the couch and begin their introductions and most avoid lying but there's definitely omissions (Bronte wants to be a mathematician! Tiffany and Paulie have siblings that were on Big Brother!) And apparently a heavy-handed edit about talking about who is attractive. Michelle notices the voice and looks of Tiffany are very similar to Vanessa from Big Brother 17. The houseguests aren't totally dumb though and notice twelve is a small amount of houseguests. Cue the twists! Three to be exact! Julie Chen insists twist #1 is a big surprise, but when a house of dingdongs notice the population problem, it's not a shocker. 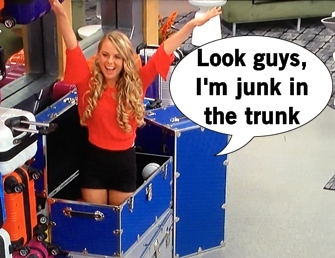 There are four stowaways hiding in suitcases in the house: Nicole from BB16, Da'Vonne and James from BB17, and Frank from BB13. The newbies are not happy to have returnees come in for a second chance to win and vow to isolate the returnees. The stowaway returnees feel outnumbered and know they'll have to sway fans to their side. Knowing his cover could be blown at any spot, Paulie announces to the group his brother Cody was the season 16 runner-up. Tiffany is awkwardly silent because she doesn't want to confess her sister secret, but Da'Vonne is well aware of the identity of the brunette across from her. Twist #2 is that the game this summer will be played in teams of four - an interesting twist I didn't see coming. How long it actually lasts is another story, but for now.. OK! The returnees are split up and get to essentially be team captains, drafting teammates in a schoolyard pick that are evenly split by gender. Here are the team breakdowns: Blue Team is Frank, Michelle, Paulie, Bridgette; Yellow Team is Da'Vonne, Paul, Zakiyah Jozea; Green Team is James, Natalie, Victor, Bronte; Red Team are Nicole Corey, Tiffany, Glenn. The competition is for the teams to sit and hold onto a rocket the longest - the first of many phallic competitions to come. In pure Big Brother fashion, they get "pooped" on by birds and hit by a storm with their oh-so-loved rain machine, all to make holding on even trickier. When the teams fall, they also win prizes/punishments. Yellow Team is the first team to fall and they are the inaugural Have Nots. The second team to fall is Blue, who will received a mystery punishment in the future. While not safe from eviction, the runner-up team wins $10k and that's the Red Team. The team to hang on the longest, Green, wins safety from the next two evictions, because there's going to be an eviction within the two-part premiere episode. 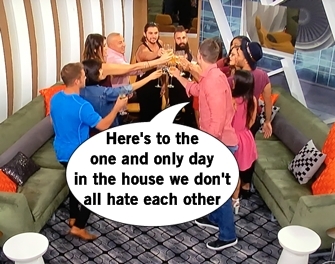 After a drawn out segment of the teams naming themselves (Blue - Category 4, Yellow - Big Sister, Green - Team Unicorn, Red - Freakazoids) and Tiffany admitting to Michelle that she is Vanessa Ruosso's sister, Julie Chen pops on the TV for one last twist. Team Unicorn gets to sit out the next three-round competition and the other three teams will compete. The winners of rounds two and three will be safe. The losing team has to then compete one more time, as individuals, and the ultimate loser is the first perfect evicted from the Big Brother house. More twist: the surviving three members of that team have to decide amongst each other which of them becomes the first HOH. And that, ladies and gents, is twist #3. Interesting, but a little BS to have competitions and not a vote or social element determine the eliminee. The "Hit the Road" round one competition is to build sand castle pyramid puzzles on a suspended being held up by their teammates, who are constantly being swapped out. It's an extremely tough competition which is extremely dull to watch with blocks being dropped constantly. 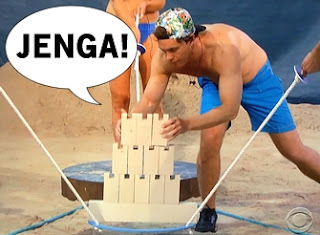 Team Big Sister have some major communication issues between Da'Vonne and Paul, and Freakazoids drop their stack with one block to go - so Category 4 wins round one. Round two is to solve an actual big sand castle puzzle on the ground - no balancing. Big Sister's communication issues rear its head again but a mistake by the Freakazoids allows Big Sister to win. This means Nicole, Tiffany, Glenn, and Corey will battle against each other to remain in the house. 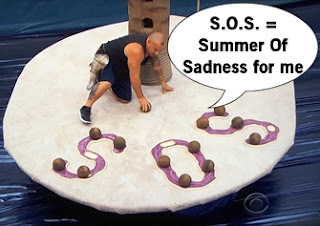 The final round of the competition has each person balancing on a deserted island, climbing up a tree to retrieve coconuts and complete the SOS message. Nicole and Tiffany complete theirs first, which leave it down to the men. Corey and Glenn grab their flags in a photo finish, but Corey grabs his slightly quicker than Glenn. It's not a surprise Glenn is eliminated and it's a Millennial house this summer. Neither Tiffany or Corey want the title, or power, of HOH which ends up playing right into Nicole's plan: she is named the first HOH, though they say it's because Nicole finished the competition first. Paul is pretty upset at Nicole becoming HOH, because as king of the newbies and house loudmouth, Paul wants the returnees out of the house ASAP. But the newbies are warming up to the veterans, Tiffany, in a pre-competition vulnerable moment, revealed her identity to Da'Vonne. Paulie feels connected to the vets because his brother was on the show previously, which makes him have more of a target. Victor blabs his entire gameplay and strategy to Nicole while outing other people's game in the process (specifically Jozea). Jozea's not that bright either and outs his entire strategy and pecking order to Da'Vonne. This idiot AKA "messiah for the newbies" really earned his spot in the carnival themed Have Not room (enjoy sleeping in a bumper car!). Nicole is furious that she's Jozea's top target and reacts accordingly: by nominating him. To assure Jozea goes home, she decides to convince Paulie to be a pawn. 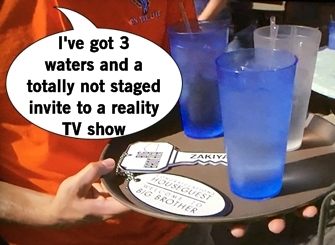 Obviously Paulie doesn't want to be a pawn because he's seen the show before and knows pawns go home. But ultimately Nicole gets to make the final call and she sticks with her plan and nominates Jozea and Paulie for eviction.